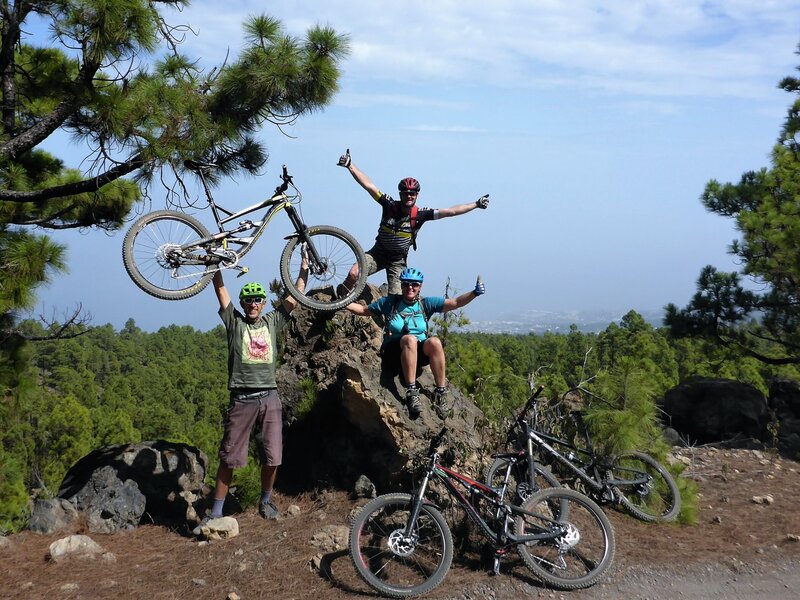 MTB cross country tours by bikers, for bikers! Sportive routes for beginners and tour bikers are offered in groups with a maximum of 8 participants. The nature experience is the focus of the XC tours with more uphills on forest and gravel roads. You will enjoy the panorama and the varied landscape and put your own fitness to the test. Concentration and full attention are required on the downhills because even wider gravel roads can be hazardous and demanding. Mountain-Mike will help you master the descends with riding tips. His long-term guiding experience and empathy ensure the best possible safety and guarantees the absolute riding pleasure. 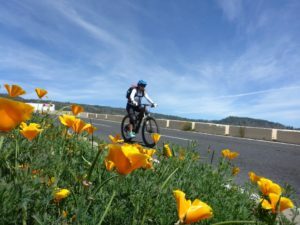 Sport bike weeks for ambitious racers and hill climbers, technical training and training camp supervision for organised groups can be organized on request. The day trips include the pick-up from the south of the island and with a maximum transfer time of an hour we will reach the different start points. After the bike tour we usually have a break in a canarian restaurant to refresh ourselves with a cool drink or “Barraquito” before returning to the hotel and having time for a swim in the Atlantic. Wearing a helmet is mandatory and should be self-evident! All participants must have an international health insurance covering mountain biking. Participation on the tours is at your own risk. 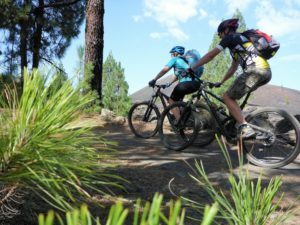 The organizer and bike guides cannot accept any liability or assumes no responsability for the consequences of self-inflicted accidents. 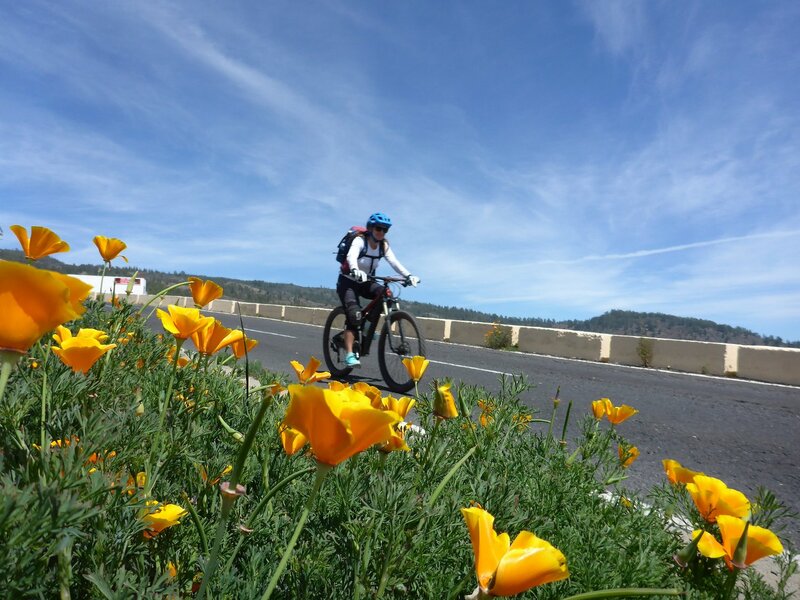 The registration should be done in advance by mail or telephone so that a tourbike in the correct size and / or helmet can be reserved. Program or tour changes due to bad weather or other unforeseen circumstances, are at the discretion of the guides and organisers. Light to medium difficulty tour above the mountain village of Vilaflor at 1500m altitude. 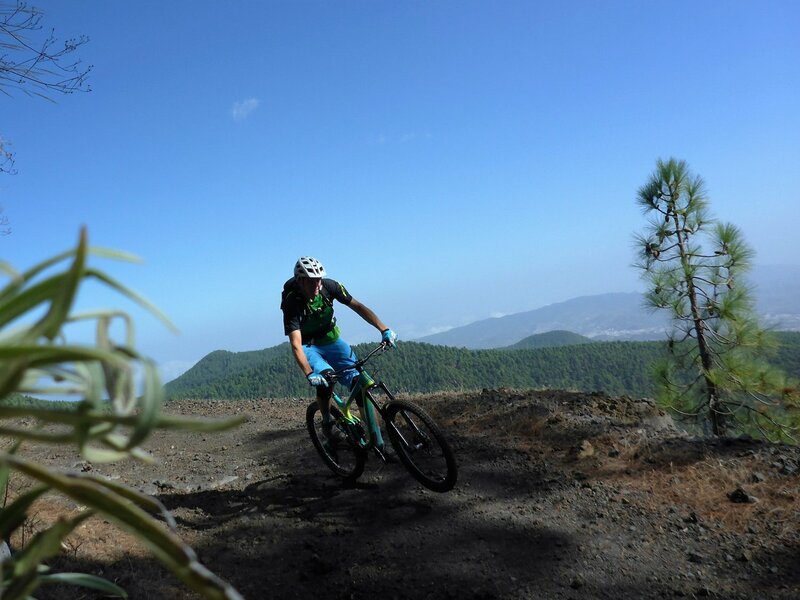 A sportive loop through the southern and warm pine forests and varied volcanic landscapes on forest roads and gravel tracks with beautiful views. We will be very close to the crater rim of the Cañadas National Park on the ascent of 400 meters. The long descent begins on an altitude of 2000m at first on gravel roads and then on low-traffic mountain roads through Vilaflor down to the viewpoint Centinela at 500m altitude. 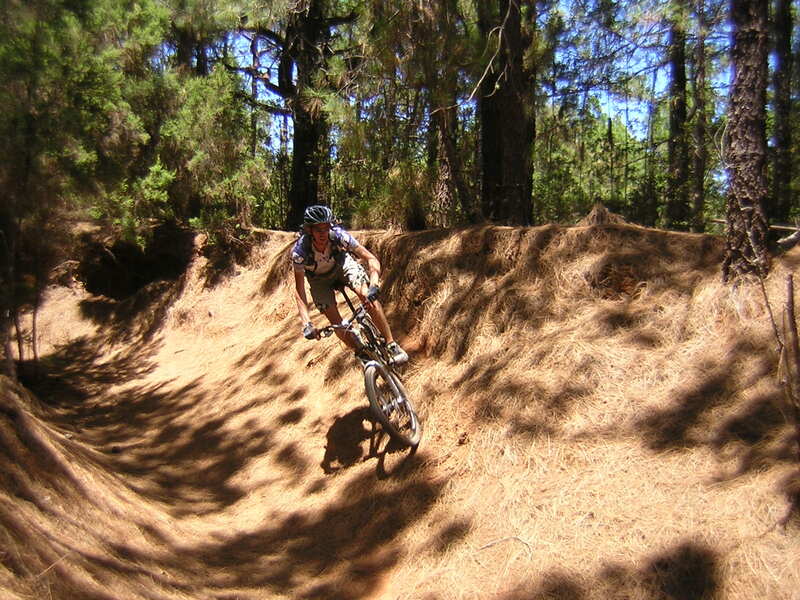 Intermediate level mountain bike tour in the refreshing, green Esperanza forest with pines and eucalyptus trees. 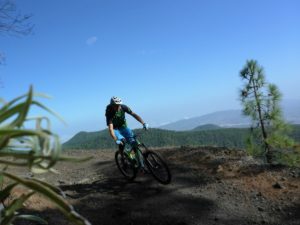 Get an experience of the different climate zones of Tenerife on the heights of the Cumbre Dorsal. In the favorite area of the local XC bikers we ride 500 meters uphill on forest roads. The partial steep climbs demand endurance and fitness. As reward you will enjoy the curvy downhill ride on off road with a lot of flow and riding fun back to the starting point. 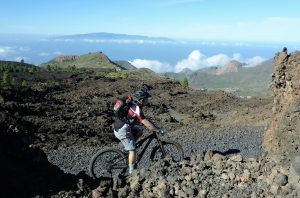 Exhausting MTB tour for experienced bikers around the volcano Chinyero. 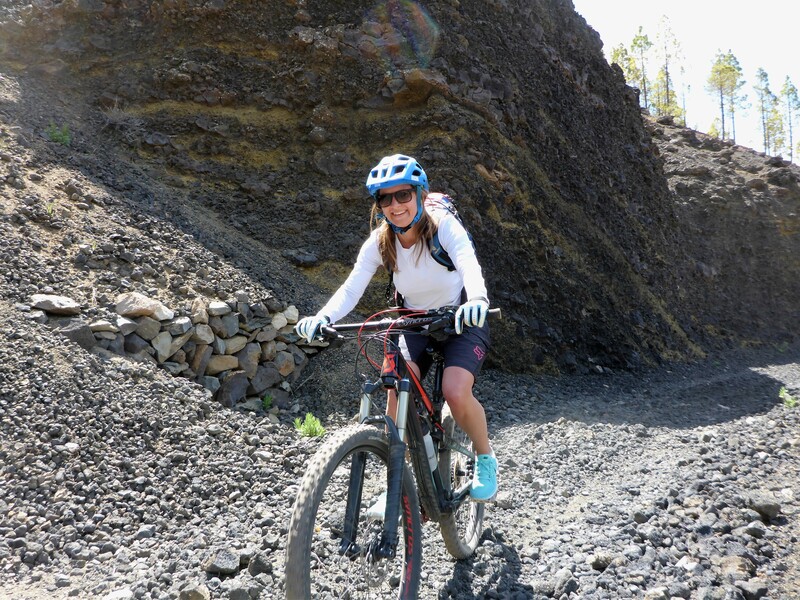 The Arenas Negras are characterized by the last volcanic eruption on Tenerife and the loose, volcanic surface demands the skill and balance on the bike uphill as downhill. 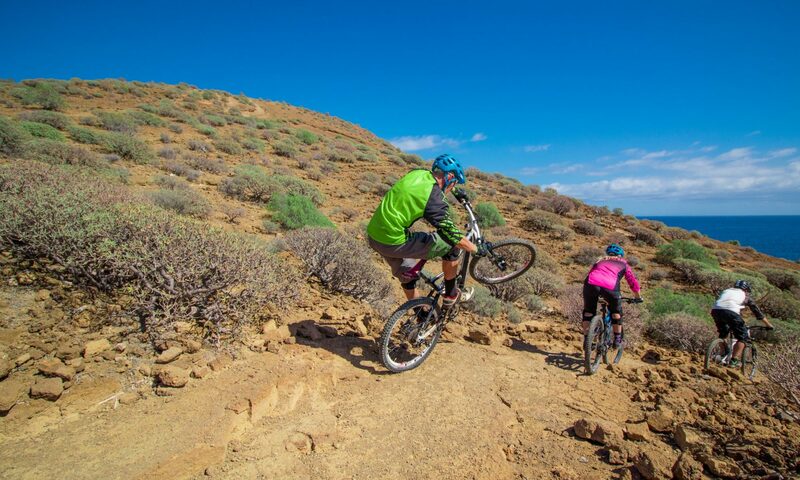 Energetic climbs are rewarded with contrasting views and landscapes on the north-west coast of Tenerife. Experience the scenery of the last four volcanic eruptions on one tour only. The descents on the black lava ashes require good bike control and riding technique.